BROOKINGS, S.D. – As El Niño develops in the Pacific Ocean, the month ahead proves to be challenging for climate forecasters, said Laura Edwards, SDSU Extension State Climatologist. "For South Dakota, there is an increased likelihood of wetter than average conditions in the western two-thirds of the state. However, the eastern one-third of South Dakota has equal chances of above, below or near normal precipitation in December," she said, pointing to the December Climate Outlook released November 15, 2018 by the National Oceanic Atmospheric Administration (NOAA) Climate Prediction Center. There is some confidence that a wetter pattern may affect the Rocky Mountains and just east of that region in the month ahead. The temperature outlook, Edwards said, is less certain for the next several weeks. "A lot of attention has been paid to a developing El Niño in the Pacific Ocean, which has often brought warmer than average temperatures to the Northern Plains in December. This year, however, it is a weak El Niño, and other atmospheric patterns can affect our region as well," she said. Currently, Edwards said climatologists are looking at the atmospheric pattern over the arctic. 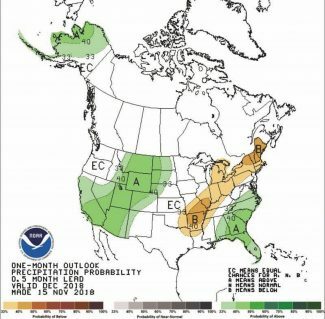 "The current pattern favors colder than average temperatures over South Dakota, which is contributing to lower confidence in the December outlook," she explained. For December through February, the updated outlook indicates that El Niño may be a more significant player after December. "The temperature outlook for the next three months shows elevated chances of warmer than average temperatures overall," Edwards said. She explained that this is consistent with a typical El Niño winter that South Dakota has experienced in the past. Current forecasts show it is about 80 percent likely to develop fully in the winter. One source of uncertainty, Edwards said, a weak El Niño event is forecasted. "Wintertime snowfall or precipitation is generally not well correlated with El Nino in the Northern Plains region," she said. 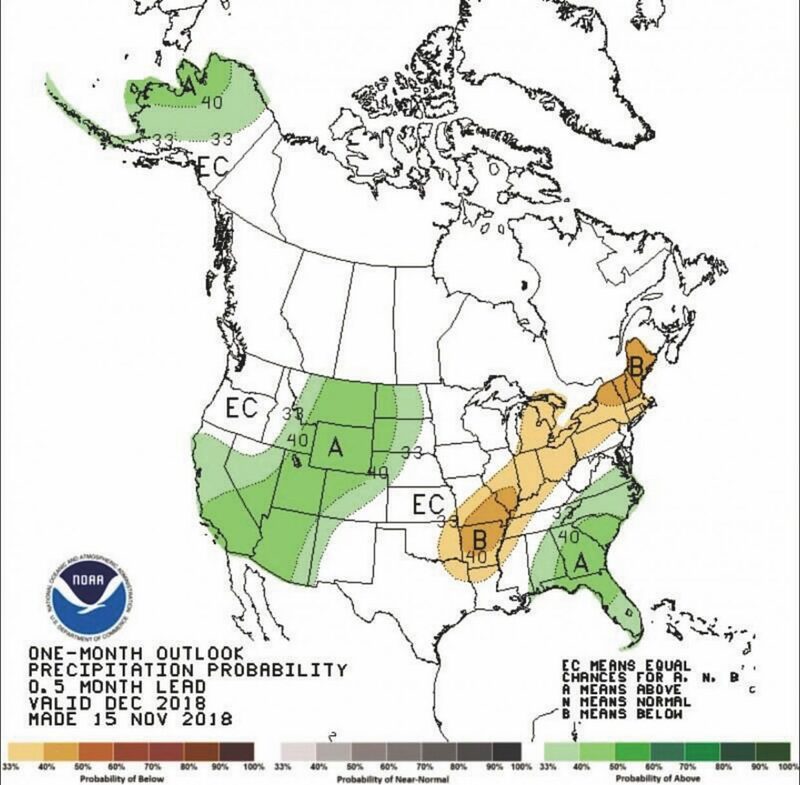 "This year's outlook is consistent with history, and is projecting equal chances of wetter, drier or near average precipitation for the next three months overall." Fall harvest is still underway in South Dakota, particularly corn harvest. Edwards said the recent drier, colder pattern has helped harvest progress in areas of the state where soils were too wet to run equipment. "Soil temperatures are cooling and frost depths for most locations are around four to six inches deep as of November 15," she said. "Frozen soils reduce mud and can ease the burden of heavy machinery on the field."